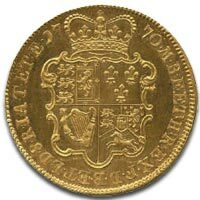 Coin Collecting Reviews – A Rare collectible George III five guinea gold coin dating c1770, by John Tanner. Obverse … Young laureate, long-haired bust with love-lock of hair on left shoulder. Reverse … Crowned shield with arms, date either side of crown. (S.3723; L&S.1; Montagu 510 attributed to Yeo; Murdoch 118/119; Nobleman W&R.76), About FDC. Ex. Glendining 12 October 1992, where it realised £49,500. Interestingly, there was also a Vigo 5 guineas in the same sale that sold for £44,000. This is without doubt one of the most spectacular and desirable antique British milled gold coins. 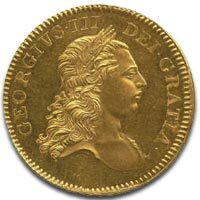 Very few George III five guinea gold coins are known and this is certainly one of the finest seen in many years. After which he was King of the United Kingdom of Great Britain and Ireland until his death. He was concurrently Duke of Brunswick-Lineburg and prince-elector of Hanover in the Holy Roman Empire until his promotion to King of Hanover on 12 October 1814. But unlike his two predecessors he was born in Britain and spoke English as his first language. Despite his long life, George III never visited Hanover. George III’s long reign was marked by a series of military conflicts involving his kingdoms, much of the rest of Europe, and places farther afield in Africa, the Americas and Asia. Early in his reign, Great Britain defeated France in the Seven Years War, becoming the dominant European power in North America and India. However, many of its American colonies were soon lost in the American Revolutionary War, which led to the establishment of the United States of America. A further series of wars against revolutionary and Napoleonic France, over a 20-year period, finally concluded in the defeat of Napoleon in 1815. In the later part of his life, George III suffered from recurrent and eventually permanent mental illness.